Written by myself and CarrieLynn, Lexington Books will release Possessed Women Women, Haunted States on November 23, 2016, and you can preorder a copy directly from the publisher or from your favorite online retailer (such as Amazon, Barnes & Noble, and more). 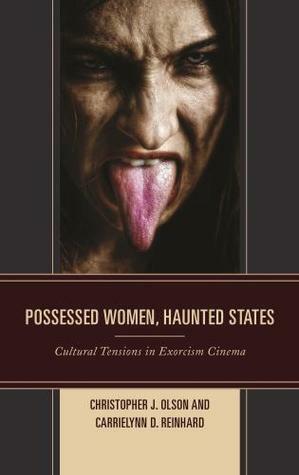 The analysis presented in this book uses various cultural and critical theories to examine how depictions of possession and exorcism reflect, reinforce or challenge prevailing social,cultural, and historical views of women, minorities, and homosexuals. In particular, exorcism films appear to explore tensions or fears regarding empowered and sexually active women, and frequently reinforce the belief that such individuals must be subjugated and disempowered so that they no longer pose a threat to themselves or those around them.Even more recent films produced after the emergence of third wave feminism typically reflect this concern about women. In fact, exorcism films very rarely present empowered women and feminine sexuality as nonthreatening. CarrieLynn and I are incredibly proud of this book (not to mention humbled by these gushing reviews), and we believe it represents an important contribution to the areas of cultural studies, media studies, and gender studies. We hope you agree. NOTE: We just got our print copies, and I discovered a mistake on p. 13; we used the wrong word when discussing queer theory. The sentence “Queer theorists challenge the idea of homosexuality as a biological necessity…” should read “Queer theorists challenge the idea of heterosexuality as a biological necessity…” Our apologies for the mistake; somehow during the revising process things got switched, and we wanted to make certain that we clearly stated the tenets of queer theory here.